Resistance among Klebsiella pneumoniae to most antibiotics is on the rise. Tigecycline has been considered as one of the few therapeutic options available to treat multidrug-resistant bacteria. We investigated the clinical and microbiological characteristics of tigecycline non-susceptible K. pneumoniae bacteremia. Adult patients with tigecycline non-susceptible K. pneumoniae bacteremia at a medical center in Taiwan over a 3-year period were enrolled. K. pneumoniae isolates were identified by the E-test using criteria set by the US Food and Drug Administration (FDA). Data on the clinical features of patients were collected from medical records. Genes for β-lactamases, antimicrobial susceptibilities and pulsed-field gel electrophoresis (PFGE) results were determined for all isolates. Of 36 patients, 27 had nosocomial bacteremia. Overall 28-day mortality was 38.9%. The MIC50 and MIC90 of tigecycline were 6 and 8 mg/L, respectively. No carbapenemase was detected among the 36 isolates. Twenty isolates carried extended spectrum β-lactamases and/or DHA-1 genes. No major cluster of isolates was found among the 36 isolates by PFGE. Intensive care unit onset of tigecycline non-susceptible Klebsiella pneumoniae bacteremia was the only independent risk factor for 28-day mortality. The high mortality of patients with tigecycline non-susceptible K. pneumoniae bacteremia may suggest a critical problem. Further study to identify the possible risk factors for its development and further investigation of this type of bacteremia is necessary. Klebsiella pneumoniae is a common cause of community-acquired and hospital-acquired Gram-negative infection of the bloodstream . The vast majority of K. pneumoniae infections (including urinary-tract infections, pneumonia, and intra-abdominal infections) are associated with hospitalization . In Taiwan, K. pneumoniae is also a major cause of community-acquired pyogenic infection [3–7]. K. pneumoniae strains harboring extended spectrum β-lactamases (ESBL) and, more recently, carbapenemase that confer resistance to multiple antibiotics, have been described in many parts of the world. These multidrug-resistant (MDR) organisms affect the choice of antimicrobial therapy, and are a major cause for increasing hospital costs and duration of hospitalizations . Tigecycline is an expanded broad-spectrum antibiotic representing a new class called “glycylcyclines”. In comparison with other tetracyclines, tigecycline displays higher in vitro activity against several Gram-positive and various Gram-negative microorganisms (including MDR strains). Resistance among K. pneumoniae to most antibiotics is on the rise globally . However, tigecycline remains active against many strains, and regarded as one of the few therapeutic options available for treating MDR bacteria. Tigecycline resistance in K. pneumoniae has increasingly been reported in European countries, with a non-susceptible prevalence of 7.5–50% . Reports from North America, South America and Asia have demonstrated that the non-susceptible prevalence is <10% . The increasing prevalence of tigecycline resistance is a growing concern clinically. However, reports of patients infected with tigecycline- resistant K. pneumoniae have rarely been identified [11–14]. Furthermore, no study has systematically analyzed clinical data on tigecycline non-susceptible isolates causing bloodstream infection in adult patients. We investigated the clinical and microbiological characteristics of bacteremia caused by tigecycline non-susceptible K. pneumoniae in adult patients during 2010–2012 from a medical center in Taiwan. This retrospective study was conducted at Taipei Veterans General Hospital (a 2900-bed tertiary-care teaching hospital) from January 2010 to December 2012. The clinical and microbiological data of all consecutive patients with ≥1 positive blood culture for K. pneumoniae strains showing non-susceptibility to tigecycline (minimum inhibitory concentration (MIC) > 2 mg/L) were collected. For patients with more than 2 positive blood cultures, only the first blood culture was included. Patients <20 years of age and those with incomplete medical records were excluded. All clinical isolates were taken as part of standard care. The study protocol was approved by the Review Board of Taipei Veterans General Hospital (Taipei, Taiwan). Identification and antimicrobial susceptibility of K. pneumoniae were determined using the Vitek2 system (bioMérieux, Marcy-l’Etoile, France). Antimicrobial susceptibility was interpreted according to the guidelines of the Clinical and Laboratory Standards Institute (CLSI) . K. pneumoniae strains showing non-susceptibility to tigecycline (MIC >2 mg/L) according to the Vitek2 system were tested further by the E-test method (AB Biodisk, Solna, Sweden) according to manufacturer instructions. Breakpoints for tigecycline were those set by the US Food and Drug Administration (FDA) (2 and 8 mg/L for susceptible and resistant, respectively) . Escherichia coli ATCC 25922, E. coli ATCC 35218 and Pseudomonas aeruginosa ATCC 27853 were used as control strains in the susceptibility assays. All tigecycline non-susceptible strains were tested by polymerase chain reaction (PCR) amplification and DNA sequencing for various carbapenemase genes (encoding class-B families IMP, VIM, NDM-1, GIM, SPM and SIM; class-A families NMC, IMI, SME, KPC and GES; and class-D family OXA-48), plasmid-borne ampC-like genes (encoding CMY, DHA and ACT) and ESBL genes (encoding CTX-M, TEM, and SHV) using methodology and primers described previously . To determine the capsular genotypes of K. pneumoniae, we undertook cps genotyping by the PCR detection of K serotype-specific alleles at wzy and wzx loci, including serotypes K1, K2, K5, K20, K54, and K57, as described previously . These capsular serotypes are regarded as having the highest association with an invasive disease or pathogenicity . Total DNA was prepared and PFGE was conducted as described previously . Restriction enzyme XbaI (New England BioLabs, Ipswich, MA, USA) was used at the temperature suggested by the manufacturer. Restriction fragments were separated by PFGE in 1% agarose gel (Bio-Rad, Hercules, CA, USA) in 0.56 TBE buffer (45 mM Tris, 45 mM boric acid, 1.0 mM ethylenediamine tetra-acetic acid (EDTA); pH 8.0) for 22 h at 200 V and 14°C and with ramp times of 2–40 s using CHEF Mapper apparatus (Bio-Rad). Gels were then stained with ethidium bromide and photographed under ultraviolet light. The Dice coefficient was used to calculate similarities. The unweighted pair-group method with arithmetic mean (UPGMA) was used for cluster analyses by BioNumerics ver5.10 (Applied Maths, Austin, TX, USA). Medical records were reviewed to extract pertinent information, including demographic characteristics; comorbid conditions and the Charlson Comorbidity Index , duration of hospital stay, duration of therapy with individual antimicrobial drugs, antimicrobial therapy administrated before the onset of bacteremia, and a ventilator, central venous catheter, or a Foley catheter at the time of bacteremia onset. The onset of bacteremia was defined as the day the blood culture that eventually yielded K. pneumoniae was obtained. Bacteremia was defined as nosocomial-acquired if the index blood culture was collected >48 h after hospital admission and no signs or symptoms of infection was noted upon hospital admission. Infections with onset ≤48 h after hospital admission were classified as healthcare-associated or community-acquired in accordance with definitions described previously . Episodes of bacteremia were considered acquired in the intensive care unit (ICU) if they appeared >48 h after ICU admission. Infection severity was evaluated using the Acute Physiology and Chronic Health Evaluation (APACHE) II score and Pitt Bacteremia Score described within 24 h before the onset of bacteremia [21, 22]. Appropriate antimicrobial therapy was defined as administration of ≥1 antimicrobial agent to which the causative pathogen was susceptible in vitro within 48 h after the onset of bacteremia with an approved route and dose appropriate for end-organ function. Antimicrobial therapy that did not meet this definition was considered inappropriate. The primary outcome measure was all-cause 28-day mortality after the onset of K. pneumoniae bacteremia. Categorical variables are absolute numbers and their relative frequencies. Quantitative variables are mean and standard deviation (SD) if distributed normally, or as median and interquartile range (IQR) if distributed non-normally. Contingency data were analyzed by the two-tailed chi-square test or the Fisher’s exact test. Continuous data were analyzed by the Student’s t-test or the Mann–Whitney U test. An exact logistic regression was used in the multivariate analyses to analyze risk factors for 28-day mortality. All factors with p < 0.1 in the univariate analyses were included in the exact logistic regression. p < 0.05 was considered as significant. Statistical analyses were carried out using SAS ver9.2 (SAS Institute Inc., Cary, NC, USA). During the study period, 40 patients with bacteremia due to tigecycline non-susceptible K. pneumoniae were identified. Thirty-six patients were finally enrolled after confirmation of susceptibility by the E-test method. The MIC50 and the MIC90 of tigecycline were 6 and 8 mg/L, respectively. The tigecycline non-susceptibility rate for K. pneumoniae bacteremia during the study period was 0.05%. The in vitro activities of the tested antimicrobial agents against the 36 tigecycline non-susceptible K. pneumoniae isolates are shown in Table 1. Among the 36 isolates, 8 isolates were not susceptible to ertapenem (MIC ≥1 μg/mL). Of the 8 isolates not susceptible to ertapenem, 5 isolates were resistant to ertapenem (MIC ≥2 μg/mL) and two of them were not susceptible to imipenem (MIC = 2 and 4 μg/mL, respectively). bMIC50: MIC for 50% of isolates. cMIC90: MIC for 90% of isolates. *Total number is 25 because 11 patients did not undergo the MIC test. One pair of K. pneumoniae strains had indistinguishable PFGE patterns (Figure 1). According to criteria described previously, no major cluster of isolates was found among those 36 isolates. 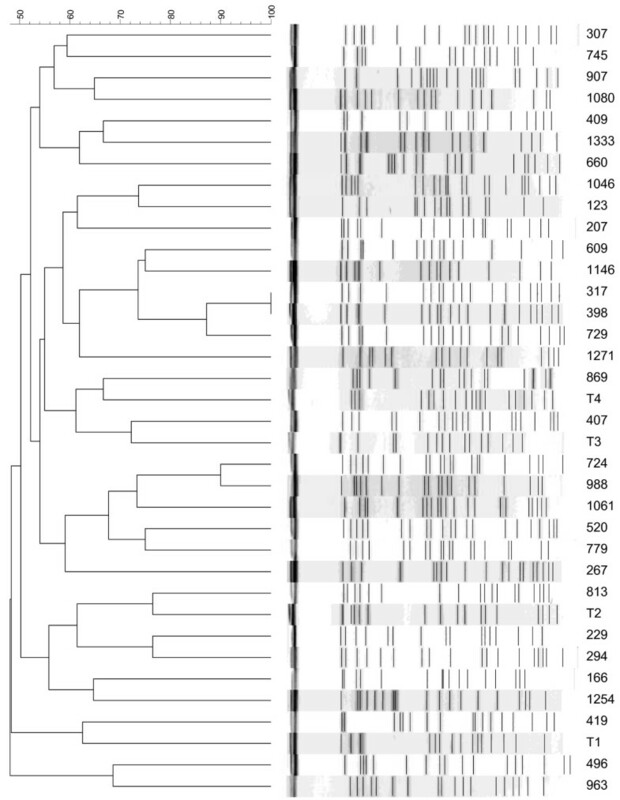 Pulse-field gel electrophoresis dendrogram of 36 K. pneumoniae isolates. Most of the isolates did not have a clonal relationship. Isolates 317 and 398 showed identical patterns. Carbapenemase genes were not detected among any of the 36 isolates. Among the isolates producing ESBLs, bla CTX-M was detected in 6 isolates. Five isolates expressed CTX-M-15, and 1 isolate expressed CTX-M-14. bla SHV-11, bla SHV-12 and bla SHV-31 were detected in 7, 3, and 2 isolates, respectively. With regard to AmpC-type β-lactamases, bla DHA-1 was detected in 18 isolates, and bla CMY-2 and bla ACT-1 were not detected among these isolates (Table 2). The results of capsular genotyping for the 6 genotypes (K1, K2, K5, K20, K54 and K57) showed that 2 isolates belonged to capsular type K2, and that 1 isolate was capsular type K54. These 3 isolates did not carry ESBL or plasmid-borne ampC-like genes. During the study period, no obvious increasing trends or any cluster of tigecycline non-susceptible K. pneumoniae bacteremia was identified. There was no epidemiological relationship between the 2 patients whose isolates had indistinguishable patterns on PFGE. The usage of tigecycline was 11.89 defined daily doses per 1000 patient-days. The clinical characteristics of the patients are summarized in Table 3. Of these patients, 27 (75%) acquired nosocomial K. pneumoniae bacteremia, and 14 patients (38.9%) acquired K. pneumoniae bacteremia in the ICU. Among the 9 patients with community-onset bacteremia, 6 patients (16.7%) were categorized as having healthcare-associated bacteremia. Most patients received antibiotics during the last 30 days. However, only 13 patients (36.1%) received tigecycline. We investigated further the previous culture-positive data for tigecycline-susceptible K. pneumoniae and associated tigecycline use in the past 90 days. Nine patients with tigecycline-susceptible K. pneumoniae isolates were identified, and 2 patients with tigecycline-susceptible K. pneumoniae isolated within 30 days before bacteremia has been treated with tigecycline. IQR, interquartile range; ICU, intensive care unit; APACHE, Acute Physiology and Chronic Health Evaluation; SD, standard deviation. aImmunosuppression includes patients who underwent solid-organ transplantation, corticosteroid therapy, and immunosuppression therapy. bBacteremia was defined to be nosocomial-acquired if the index blood culture was collected >48 h after hospital admission and no signs or symptoms of infection were noted at hospital admission. Bacteremia with onset ≤48 h after hospital admission was classified as healthcare-associated infection if patients met any of the following criteria: having received intravenous therapy at home or in an outpatient clinic during the past 30 days; having received renal dialysis in a hospital or clinic during the past 30 days; having hospitalized for 2 or more days during the past 90 days; or having resided in a nursing home or long-term care facility. Pneumonia, intra-abdominal infection, and biliary-tract infection (BTI) were the common sources of bacteremia. The clinical syndromes of patients infected with the capsular type-K2 strain were pneumonia and BTI. BTI was evident in the patient infected with the capsular type K54. The treatment regimen after the sensitivity reports were available included: 13 patients received carbapenem, 11 patients received cephalosporins, 4 patients received fluoroquinolones, and 2 patients received β-lactam/β-lactamase inhibitors. The remaining 6 patients died before the sensitivity reports were available. Among these 6 patients, 4 patients received tigecycline, and 2 patients received carbapenem empirically. The overall 28-day mortality among patients infected with tigecycline non-susceptible K. pneumoniae was 38.9%. Univariate analyses of the factors associated with 28-day mortality are shown in Table 4. The exact logistic regression model showed that the only independent risk factor for 28-day mortality is ICU onset of tigecycline non-susceptible Klebsiella pneumoniae bacteremia (odds ratio (OR) 13.46, 95% confidence interval (CI) 1.35–637.17, p = 0.021). aAll factors with p < 0.1 in univariate analyses were included in the exact logistic regression. bImmunosuppression includes patients who underwent solid-organ transplantation, corticosteroid therapy, and immunosuppression therapy. We demonstrated here, for the first time, the clinical and microbiological characteristics of tigecycline non-susceptible K. pneumoniae bacteremia in Taiwan. Most patients had nosocomial bacteremia, and the overall 28-day mortality was 38.9%. The MIC50 and MIC90 of tigecycline were 6 and 8 mg/L, respectively. Among all isolates, 18 were ESBL producers, and DHA-1 was detected in 18 isolates. No carbapenemase genes were detected among all 36 isolates. According to the results of PFGE, most isolates were epidemiologically unrelated. Interpretive criteria for the in vitro susceptibility testing of tigecycline are based on the breakpoints approved by the FDA or on those published by the European Committee on Antimicrobial Susceptibility Testing. The CLSI has not released tentative or approved guidelines. Differences in susceptibility results according to the MIC interpretive criteria of the two guidelines as well as the testing methods used have been emphasized in several reports . One recent study questioned the performance of the Vitek2 automated system to reliably determine the susceptibility of Enterobacteriaceae species other than E. coli to tigecycline . Moreover, it has been reported that the E-test shows the best correlation with the broth microdilution method, and exhibits lowest error rates as well as highest essential agreement and categorical agreement . In general, the Vitek2 automated system produces higher MIC values than E-test doses, which can potentially result in false resistance findings using the former approach . E-test susceptibility results obtained using the FDA criteria could be considered as a reliable method for tigecycline testing, as shown previously . In the current study, isolates reported as being non-susceptible to tigecycline by the Vitek2 system were confirmed with the E-test method to avoid the misclassification of the results. Common sources of bacteremia in our study include infections of the lower respiratory tract, BTI, and intra-abdominal infections. One report suggested that clinicians should be aware of the potential risk for treatment-induced tigecycline resistance, especially if urine is the main source of bacteria . In contrast to that report, we identified only 1 case with a urinary-tract infection. Physicians should recognize that the emergence of tigecycline non-susceptible K. pneumoniae bacteremia can be associated with various syndromes. The mechanisms of resistance mediating the effectiveness of tigecycline have been attributed to RNDtype transporters and other efflux pumps . Analyses of clinical studies suggest that long-term tigecycline monotherapy may carry a higher risk for developing tigecycline resistance . One recent study investigating non-susceptibility in K. pneumoniae and E. coli isolates causing neonatal septicemia found increasing tigecycline MIC values from 2007 to 2010. This increase cannot be attributed to the use of tigecycline because of the restricted use of this antibiotic in their hospital. The author suggested that the elevated MIC of tigecycline might be attributed indirectly to the use of other antibiotics that are also effluxed through the AcrAB–TolC pump . In the current study, although most patients received one or more antibiotics in the past 30 days, only 36.1% of subjects were treated with tigecycline in the past 30 days. Further study to analyze the risk factors for tigecycline non-susceptible K. pneumoniae infection is necessary. In the present study, PFGE analyses revealed that tigecycline non-susceptible K. pneumoniae isolates causing bacteremia were not clonal in Taiwan. This implies that the acquisition of tigecycline non-susceptibility in invasive K. pneumoniae isolates was most likely through independent mechanisms. Such non-clonal occurrence of tigecycline non-susceptibility in invasive K. pneumoniae isolates suggests that tigecycline resistance may be due to selective pressure, including increasing, inappropriate and inadequate use of antibiotics. Antibiotic stewardship will be essential for helping us understand whether this holds true in real-life situations. The 28-day mortality among patients with tigecycline non-susceptible K. pneumoniae bacteremia was 38.9%. The case mortality of K. pneumoniae bacteremia has been found to be ≈20% . With respect to drug-resistant K .pneumoniae bacteremia, the mortality in those with carbapenem-resistant K. pneumoniae bacteremia is ≈40–50% [21, 26–28], and ≈20–30% in ESBL-producing K. pneumoniae bacteremia [21, 22]. The present report is the first to point out high mortality among patients with tigecycline non-susceptible K. pneumoniae bacteremia in Taiwan. One recent study found that most (75%) of the tigecycline resistant K. pneumoniae were Klebsiella pneumoniae carbapenemase producers . Surprisingly, no carbapenemase-producing K. pneumoniae were identified in the current study. The emergence of tigecycline non-susceptible K. pneumoniae bacteremia, in addition to carbapenem resistance, may become an imminent issue in the foreseeable future. We also found that the ICU onset of tigecycline non-susceptible K. pneumoniae bacteremia was an independent risk factor for 28-day mortality. Resistance to tigecycline could be simply a marker of disease severity as shown in infections caused by other resistant microorganisms. In addition, we identified 3 isolates belonging to the capsular serotypes K2 and K54, which are thought to be associated most closely with an invasive disease and/or pathogenicity. The MDR K. pneumonaie strains rarely belonged to the virulent capsular types (K1, K2, K5, K20, K54, and K57). It would be of interest to study the relationship between these capsular types and tigecycline non-susceptible strains. Our study had several limitations. The important limitations were inherent to its retrospective design and the limited number of occurrence in a single institution. Caution must be taken to interpret data from a small number of cases. In addition, our study did not include a control group to identify specific risk factors or to compare the prognostic implications. Finally, we did not investigate the possible mechanism (e.g., overexpression of different efflux pumps) among these K. pneumoniae isolates. Nevertheless, our study was the first to describe the characteristics of tigecycline non-susceptible K. pneumoniae bacteremia in Taiwan, and will provide an important foundation for further work in this emerging area of interest. The high mortality of patients with tigecycline non-susceptible K. pneumoniae bacteremia may indicate a critical clinical problem. The emergence of tigecycline non-susceptible K. pneumoniae bacteremia in our hospital merits further studies to identify potential risk factors for its development. Some results from this study were presented orally at the 28th International Congress of Chemotherapy and Infection (ICC 2013) in Yokohama, Japan. This work was supported by grants from Taipei Veterans General Hospital (V102B-022 and V103B-016). The authors thank Ms. Chiu-Mei Yeh for her endorsement and assistance in the statistical analyses. YTL conceived the study, and participated in its design and coordination. YTL, FDW, YJC, and YCF reviewed and collected the data. YTL analyzed and interpreted the data. YTL drafted the manuscript. FDW and CPF reviewed the manuscript. All authors approved the final manuscript.